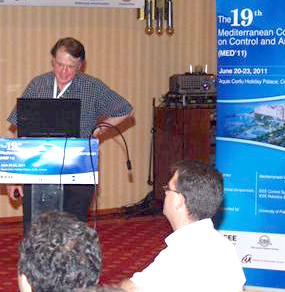 Professor John Baras (ECE/ISR) gave the invited plenary lecture at the 19th Mediterranean Conference on Control and Automation, (MED2011) in Corfu, Greece, June 22. Baras spoke on “Cooperative Networked Systems: Multiple Graphs, Coalitional Games, New Probabilistic Models.” The theme of his talk was the challenges and opportunities for the development of new foundational principles and methodologies for the emerging discipline of networked systems. In his lecture, Baras considered networked systems from various domains including control, communications, sensing, sociology, economics and biology. He described a general model he has developed for such systems that involves several interacting dynamic multigraphs, and identified three fundamental research challenges underlying these systems. He then introduced the framework of constrained coalitional games and showed that it captures in a fundamental way the basic tradeoff of benefits vs. cost of collaboration, in networked systems. Baras demonstrated that various simple models of constrained coalitional games can explain network formation and the emergence or not of collaboration. He then proceeded to investigate the interrelationship between the collaboration and communication graphs in networked control systems and the role of the communication topology, among the collaborating agents, in improving the performance of distributed algorithms on graphs, such as convergence speed. He showed that Small World graphs emerge as a good tradeoff between performance and efficiency in consensus problems, where the latter serves as a prototypical coordination problem. Baras then discussed extensions to expander graphs and presented several results on designing communication topologies for collaborative control, some inspired from biology. Finally, he took a fresh look at the probability and information models that can support the analysis and synthesis of distributed, networked multi-agent systems operating with at least partial asynchrony. He demonstrated that such systems cannot support probability models based on Kolmogorov-type models including cartesian products of the same. The probabilities needed have to be built on a logic model that is based on observables and on the geometry of subspaces of finite dimensional Hilbert spaces rather than the logic of subsets of sets. Baras showed that with new probability models and the associated information models, several difficult problems in distributed inference and control of networked systems become convex optimization problems.